There are many popular-level books on Israel, all representing a strong and rather one-sided pro-Israel position (Christian Zionism). Several recent publications offer a more nuanced assessment with a lot more depth, without going into the opposite extreme. Brother Andrew, Al Janssen, Light Force (2004). Brother Andrew became known as ‘God’s Smuggler’ after he founded the organization that smuggled millions of Bibles and Christian literature into communist countries. Back then, he challenged the church in the West not to fear, but to love the people of the East. In Light Force, he is once again speaking to the church with a prophetic voice, this time on behalf of a very different part of the world. At a time when many people were still trembling for the Soviet empire, Brother Andrew became convinced that communism in Eastern Europe would soon collapse, and began to turn his attention to the Muslim world and the Middle East. This is the account of his amazing journey. It tells of the remarkable discoveries he made simply by listening to Israelis, Lebanese, and Palestinians, and by doing what he thought Jesus might have done in a similar situation. In the process, we gain a better insight into Israel and the Occupied Territories than from the newspaper or from the vast majority of Christian books on Israel and the Middle East. This is a dangerous book, but one every evangelical should read. Peter Walker and Philip Johnston (ed. ),The Land of Promise (InterVarsity/Apollos, 2000). The Land of Promise contains a collection of articles dealing with the various dimension (biblical, theological, contemporary) of the promise of the land made to Israel in the Old Testament. Excellent biblical studies material. Colin Chapman, Whose Promised Land? (Lion, 2002). The second book also deals extensively with the land promise and its biblical foundation. In addition, Chapman offers a thorough overview of the nature and the history of the present-day conflict resulting from two peoples claiming the same territory as their own. It is a remarkable attempt to look at both sides of the issue and be fair and unbiased. It is by far the most comprehensive and best-informed book on a popular level I have seen. Surprised by Hope: Rethinking Heaven, the Resurrection, and the Mission of the Church (HarperOne, 2008). Paul Boyer, When Time Shall Be No More: Prophecy Belief in Modern American Culture (Belknap Press of Harvard University Press, 1992). This is an embarrassing book for evangelicals. The author is a historian who studied Christian views of the end times by reading over three hundred popular books on the topic. On reading what we apparently believe on topics such as the atomic bomb, the rapture and the great tribulation, one is left with the question, are we really this stupid? Awesome and highly interesting. 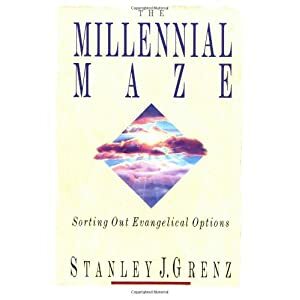 Stanley J. Grenz, The Millennial Maze: Sorting Out Evangelical Options (InterVarsity, 1992). Fortunately, there are also sane evangelical discourses on the topic, even though they are rare (I can think of only a few besides this one and the next, which I could wholeheartedly recommend). This book offers a balanced assessment of each of the major views. Daniel J. Lewis, Three Crucial Questions about the Last Days (Baker, 1998). These questions are: Are we living in the last days? Should Christians try to predict Christ’s return? What must Christians believe about the last days? The book is much better than these questions might make you think, seeing that they don’t say anything about meteorites hitting the earth or nuclear war in the Middle East. Well, to be honest, neither does the book, but it still is a great one to read. In technical terms, the author seeks a middle course between covenant theology and dispensationalism in the form of a biblical-theology approach (as opposed to, or to be distinguished from, a systematic-theology approach). But don’t be frightened by this jargon, it is not difficult to read and highly enlightening. Willem A. VanGemeren, Interpreting the Prophetic Word (Zondervan, 1990). This book deals with the interpretation of Old Testament prophecy, including the eschatological (end times) aspects. The book is not easy to read, in part because the author’s train of thought is often less than clear. However, it offers great insight into the nature and meaning of the Old Testament vision of God’s future, like no other book I know. © Youth With A Mission Hurlach.